Co. Waterford: Ballysaggartmore (2), Cappoquin (4), Castlerichard (2), Kilcochlin (2), Lismore (4), Macollop (2), West Modeligo (2), Tallow (4), Temple Michael (2). The Board also included 8 ex-officio Guardians, making a total of 32. The Guardians met at noon on the first and third Thursdays in the month. The population falling within the Union at the 1831 census had been 34,382 with divisions ranging in size from Kilcochlin (population 1,461) to Tallow (7,243). 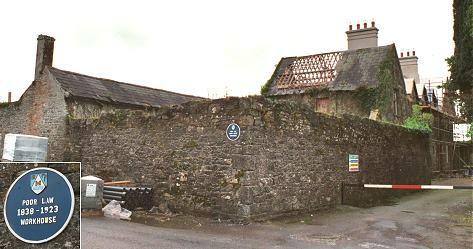 The new Lismore Union workhouse was erected in 1840-41 on a four-acre site half a mile to the south of Lismore. Designed by the Poor Law Commissioners' architect George Wilkinson, the building was based on one of his standard plans to accommodate 500 inmates. Its construction cost £5,500 plus £1,000 for fittings etc. The workhouse was declared fit for the reception of paupers on 1st December 1841, and received its first admissions on 18th May 1842. The site location and layout are shown on the 1907 OS map below. The main accommodation block had the Master's quarters at the centre, with male and female wings to each side. From the 1907 map, it appears that children's schoolrooms were located at each side of the block. 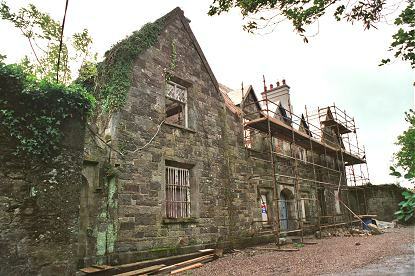 At the rear, a range of single-storey utility rooms such as bakehouse and washhouse connected through to the infirmary and idiots' wards via a central spine containing the chapel and dining-hall. A small mortuary was located at the eastern boundary wall of the site. During the famine in the mid-1840s, a store-house was hired to accommodate 100 extra inmates. Fever patients were sent to the Lismore Fever Hospital located at the north of the railway station. The workhouse had its own burial ground to the north of the workhouse. 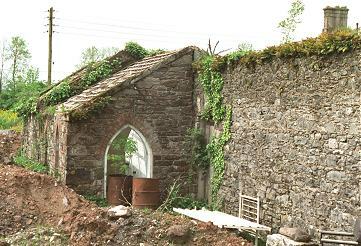 The Lismore workhouse had its own Turkish bath which was visited in 1863 by the Medical Officer of the adjacent Fermoy Union. His reports on the matter are reproduced below. 2nd March 1863.—With reference to the subject of the Turkish bath, I beg to make a few remarks explanatory of its effects and practical utility. The Turkish bath consists essentially of heated air applied to the surface of the body, the effect of which is at first an increase of the insensible perspiration, and gradually a softness and moisture of the skin; finally, a general and copious perspiration breaks out. After the continuance of which, for some time, the body is douched plentifully with tepid, and lastly with cold water; the refreshing and invigorating effects produced by the latter steps of the process are best known to those who have personally experienced them. The bath is thus a powerful and certain promoter of the functions of the skin, thoroughly opening its pores, and setting free from the system the various morbid and impure matters retained in the blood. It is also a thorough cleaner, and a tonic and bracer to the whole frame. It is a useful remedial agent in a large class of diseases where a determination to the surface, and free cutaneous transpiration are indicated. For example, in congestive and inflammatory states of the internal organs and viscera, the lungs, liver, and kidneys in particular, renal dropsy, Bright's disease, &c. &c. In virtue of its eliminating power, it has been successfully employed in the treatment of rheumatism, sciatica, and gout, and its tonic properties have been found valuable in scrofula and the early stages of pulmonary consumption. Its beneficial effects in the treatment of skin diseases are obvious. On the whole, I regard it as a valuable aid to medicine in the treatment of disease, not of universal, but of very extended applicability; and in this opinion. I am borne out by every medical authority whom I have consulted. Besides its curative powers, its value as a prophylactic of disease, should not be underrated. In conjunction with the master, I visited the Lismore Workhouse last week. The results of the employment of the bath in that establishment have been highly satisfactory. All the inmates, with the exception of the extremely old and infirm, take it weekly with benefit, and in no instance has its use been attended with injurious consequences. The bath, as usually constructed, comprises three compartments, the outer room, of the temperature of the external air, the middle room, heated from 100° to 110°, and the inner from from 120° to 140° In Lismore, there are but two apartments, one of the temperature of the outer air, or rather a few degrees above it, from its proximity to the hot air room; the hot room averages about 120 degrees, and appears to work satisfactorily at that temperature. The whole has been got up at a cost not exceeding 50l. The nearby Midleton Union had also installed Turkish baths, as had the Cork and Limerick District Lunatic Asylums. 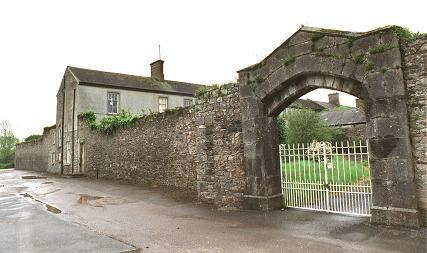 The workhouse later became St Carthages Hospital. The premises were afterwards used for fire-brigade training. The surviving workhouse buildings are now (2002) being refurbished as residential accommodation. Waterford County Archive Service, Dungarvan Central Library, Davitt's Quay, Dungarvan, Co. Waterford. Holdings include Board of Guardians minute books (1847-1924). Detailed description of surviving records.